The IGCSE Geography Fieldwork opportunities shown below cover the Edexcel International GCSE Section C Practical Geographical Enquiry requirements. They also help develop knowledge and understanding of a broad range of geographical concepts included in the Edexcel IGCSE Geography specification content. 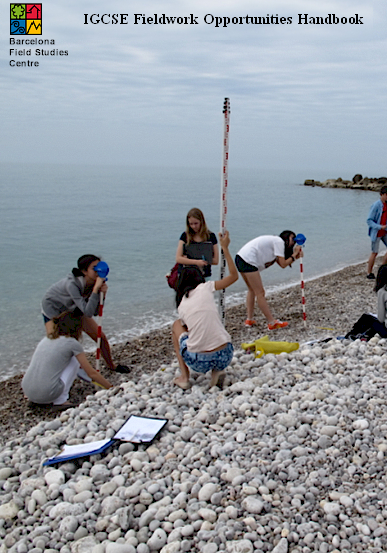 The field studies are supported by our Geography IGCSE Fieldwork Opportunities Handbook. To investigate changes in river channel characteristics from source to mouth. Measuring river velocity, channel cross-sectional area, gradient and bed load. Changes in channel characteristics between source and mouth along the River Tordera will conform to the Bradshaw model. To investigate changes in river water quality from source to mouth. Sampling macroinvertebrates as indicators to assess changes in water quality. Correlate with changes in water temperature, dissolved oxygen, conductivity, turbidity and total dissolved solids. 1. Water quality will decline with distance downstream. 2. Increased pollution downstream will reduce the macroinvertebrate diversity. To investigate beach profiles and sediment characteristics. For a shoreline-to-cliff foot/sea-wall transect you need to be familiar with equipment and procedures to measure: length, height and slope of beach plus size/shape of material along the transect. The storm beach has larger sediment size than the swash zone. A shingle beach has a steeper profile than a sandy beach. To investigate the conflicts between development and conservation on a stretch of coastline. Questionnaire design and sampling to obtain the views of different coastal users. Local stakeholders or groups in Torredembarra will be against the building of 550 second homes on the Muntanyans sand dunes and wetland. To investigate the location factors of factories or services. To assess the reasons why companies have moved to the 22@ New Technologies district of Barcelona. Mapwork, sampling, location visit, secondary sources may be involved plus analysis/conclusions. 22@ New technologies District, Barcelona. Companies locating in the 22@ New Technologies District will have similar location needs and requirements. Investigating the causes and consequences of de-industrialisation. Mapwork, location visit, secondary sources may be involved plus analysis/conclusions. Poble Nou and 22@ New technologies District, Barcelona. De-industrialisation in Poble Nou has both negative and positive consequences. To investigate adaptation, succession and biodiversity in a sand dune ecosytem. Contruction of a dune transect, vegetation sampling and species identification. 1. There are a variety of ways in which species adapt to the hostile conditions in a dune environment. 2. Biodiversity will increase with distance inland. 3. Vegetation succession will lead to a reduction in biodiversity. To investigate the relationship between environmental quality and land use within the urban area. The construction and implementation of an EQS study; sampling and transects. Understand the follow-up data presentation techniques, analysis/concluding and overall evaluation. Barcelona - a transect from the suburbs to the inner city. Environmental quality will improve with distance from the CBD. To investigate the land use pattern of an urban area. Be able to explain how to set up an urban land use survey to include ideas of how to sample an area and the classifications to be used. Barcelona's land use pattern conforms to the Burgess or Hoyt urban models.